For placing orders just send me an e-mail. Ohio residents has to pay sale's tax to your total order from the county you live in. 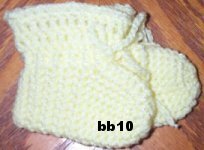 Price is $10.00 each. Postage not included. 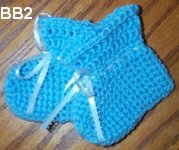 Price's start $20.00 each. Postage not included. 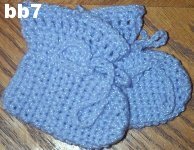 Price starts at $15.00 each. Postage not included. 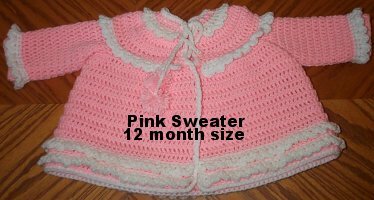 Sweater size's for is 0-6 months. This is all I have for now but can take order's. 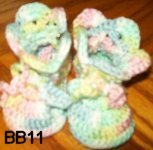 Price is $15.00 each. Postage not included. 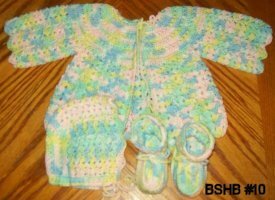 Sets so far is for 0 to 6 months. 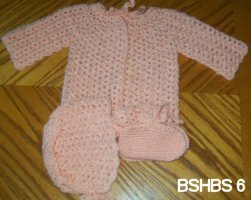 Price for a 3 piece baby sets are $20.00. Postage not included. 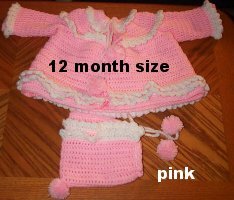 Sets so far is for 0 to 6 months. 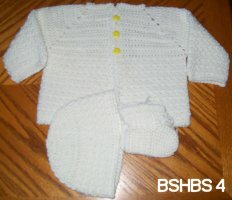 Price for a 3 piece baby sets are $25.00. Postage not included. 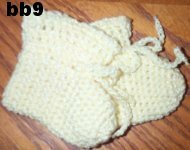 $8.00 each pair. Postage not included. 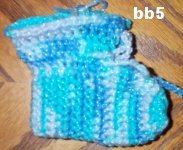 $5.00 each pair. Postage not included. 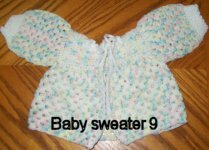 $10.00 each pair. Postage not included. 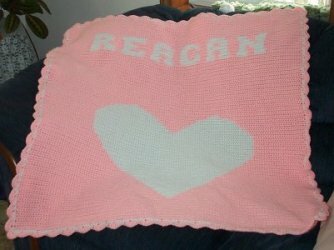 This here is a personalized baby blanket that was a special order. 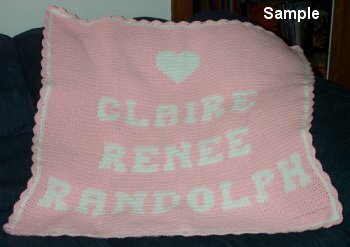 If you would like a personalized blanket done just e-mail me about it. Just let me know what you want on it and I will see if I can do it. 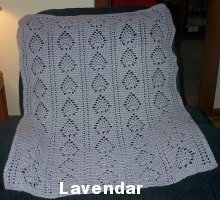 This baby afghan is made using lavendar. 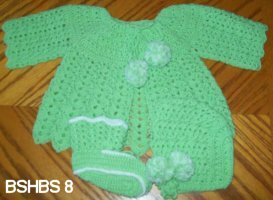 Price is $60.00. Postage not included. 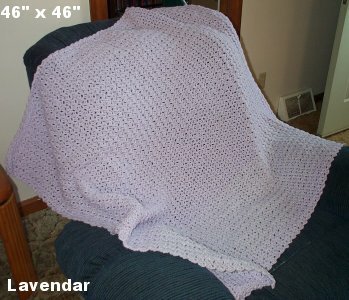 This blanket measure's about a 39" square maybe a little smaller. 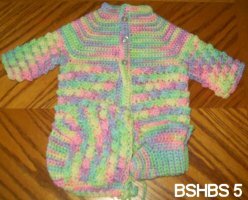 Price for this one is $50.00. Postage not included. 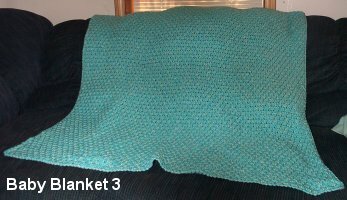 This baby blanket was made using a soft light turquoise color with a some other frinkled colors in with it. 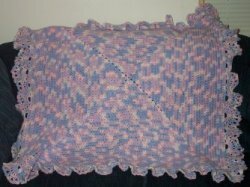 Price is $50.00. Postage not included. 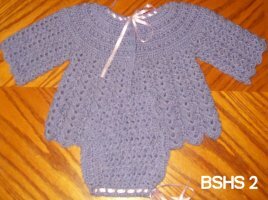 This one is made using baby sport yarn in Lavendar. 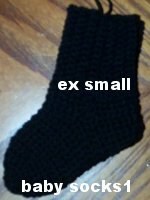 I will have size listed as soon as I can. 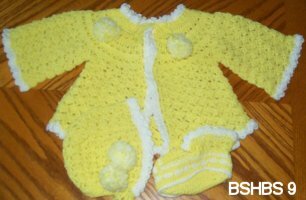 Price is $50.00. Postage not included. 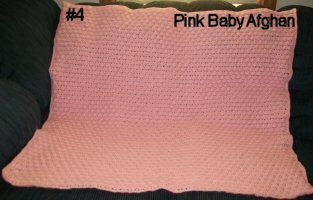 This baby afghan is pink. 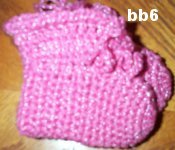 Is made with the puff stitch. Will get finished size as soon as I can. 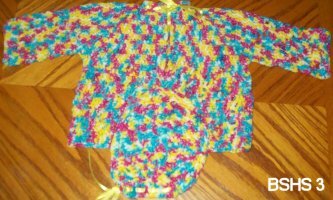 Price is $50.00. Postage not included. 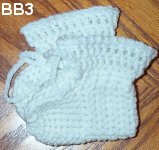 Looking for baby bibs? 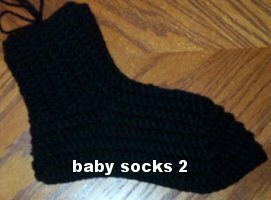 Here is some that I have made up. 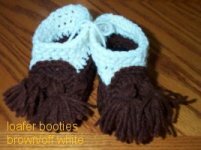 They are made in cotton yarn and buttons in the back. 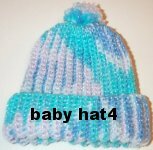 If you are interested in any e-mail your order and also make sure I do still have them. I some times can't get to my site to remove things right away. 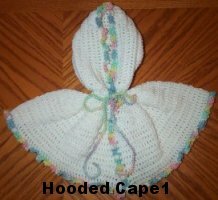 Price for one of these is $5.00. Postage not included.